Why is Mister Cool’s Cool? How does a small, Main Street business compete for customers in our online, ever-connected and exaggeratedly competitive world? Every business needs to evolve with the times; so the answer isn’t easy but it is fairly simple. Let me use a recent suit purchase at my local men’s clothing store, Mister Cool’s Clothing, to demonstrate why the customer right in front of you is the only one that truly matters. 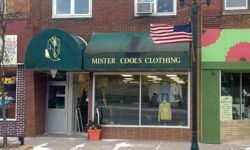 Last summer my son and I went to Mister Cool’s Clothing to find a suit for his business school in the fall. During orientation back in June, the Dean said that every Friday, starting the first week, students are required to wear suits because they start bringing business leaders into classrooms. To make good first and continuous impressions, he requires students to wear business attire; suits or dresses (not jackets, which my son already owns from our last trip to the school for a scholarship interview). I figured he’d eventually need one because of his major, but I didn’t quite expect it so soon. Neither of us is big fans of clothes shopping, so we were both slightly dreading the assignment. Thankfully, Mister Cool’s Clothing had exactly what we were looking for; both in product and experience. I may or may not be the best or average customer at a place like Mister Cool’s Clothing. It’s probably not every day that a mom of a 19-year-old comes in looking for a suit. I believe tracking some business metrics like Net Promoter Score or customer retention are important, but they are only indicators. Here are six questions to ask yourself about the individuality of each customer. 1. What is the perceived need? You could look at this in different ways. From my perspective, the need was high. As a mother, I want my son to put his best foot forward, make good impressions and look like he belongs. And, I heard the Dean say this was mandatory. From my son’s perspective, there was more wiggle room. He figured that his sportcoat purchased for earlier in the year for a scholarship interview and a pair of dress pants would suffice. If he were paying, we wouldn’t be buying. When asked what we needed help with today, I did explain the need from my perspective – since I was the one paying. What to do: If your customers don’t provide their need upfront, ask a few qualifying questions to get more information about wants versus needs so you know how to better serve each customer. Even if they give you a glimpse of their need, for example, “my son needs a suit for college”, you might want to ask a bit more about the specifics of that need (for what events, for instance) so you provide the best-customized service possible. 2. What/who is driving the purchase? In this case, the driver is the Dean of the Business School with me as a big contributor. The likelihood of my son having to purchase a suit during college was high. The profession he is pursuing, Actuarial Science, is likely to require more formal dress on occasion, if not frequently. It was probably pretty obvious when he asked us how he could help and I did the talking that I was the likely purchaser. My son barely spoke since he didn’t want to be there. This one is a little tricky because the owner had to pay attention to both me, the one paying, and my son, as the person who will make the ultimate nod as to what he’s willing to wear. What to do: If you aren’t clear on who the “driver” is, ask a few qualifying questions about what or who brought them in today. Maybe they’ll give up who they want to be like or who sent them in. Bonus points if you find out one of your marketing techniques helped guide them to the store. 3. How much is the customer willing to spend? I don’t recall if he asked me about my budget and in my case, it didn’t really matter. There wasn’t a specific number I would have provided. However, a good salesman would have taken my cue regarding college to guess that some big expenses would come soon. In fact, a really great salesperson would have made a statement empathizing the cost of college which might get me to say more about my financial situation and willingness to spend. I had a number floating in my head. We spent more than that because of the value I placed on getting my son outfitted in less than 15 minutes. When asking about budgets be careful how you ask. I would start out by asking what they’d like or want to spend rather than what they are willing to spend. The number they are willing to spend may be beyond what they tell you. If you start with the “want to” budget you may move up to “willing to” budget. What to do: Ask about money when it will help you provide more customized service. It’s not always necessary. When you do, start with,” what are you looking to spend today?” Pay attention to little cues that might already be indicators. Empathize with the customer and you’ll get them to open up more. Or, get excited with your customer in the case of a seemingly unlimited budget. 4. Where else does my product or service exist and how accessible is it to my target customer? Mister Cool’s Clothing is the only place in town for men’s suits. Beyond that, most residents drive to a larger city like Sioux Falls, Mankato or St. Cloud (all at least an hour away) and make a day of shopping. I am not what you would consider a “shopper” so trips for the purpose of shopping may only occur around Christmas. I did not want to travel simply for a suit. There is no local competition especially for someone who needs a suit right away. Perhaps only by word of mouth do people learn about how “Mr. Cool” can take one look and be on spot with size. It’s not indicated on the website or social media except for a few reviews. One included a man who came from Wisconsin for a wedding and left his dress clothes behind. “Mr. Cool” was able to outfit the 2XL man in 10 minutes. If I were “Mr. Cool”, I’d make this service as widely known as possible. It’s the customized service people crave. What to do: Make sure you know your competition and then spread the word about the special skills and services you have that aren’t likely to be found elsewhere. Listen to what your customers are saying, not what you think you’re doing. Using platforms such as a Facebook page or blog are great ways to quickly access your customer base. 5. How are the buyer’s personality, preferences, and beliefs about the product, service or industry affecting the purchase? My son relies on my style choices for dress clothes because his style is t-shirts, shorts, and tennis shoes (as I’m writing I’m thinking it might be smarter for him to work with someone more stylish). I know his favorite color is blue, anything blue. He likes to blend into the background, so nothing bright or bold. He is so slim and tall, that especially for dress clothes, he has to try them on (or maybe it’s just my “mom belief” that clothes should be tried on). I prefer longer term wardrobe pieces more than temporary styles and since he only buys clothes at my persuasion, I assume he also wants them to last. Yes; I’m middle-aged but he’s young and not so hip. I like to buy local, but I’m not an only local shopper. I rarely pay full price for clothes. They have to make me look like a star if I do. And these are all just preferences I quickly brainstormed. I’m certain I have more. “Mr. Cool” found a navy suit in the exact size my son needed. He tried it on and I would have said it fit perfectly. But, he suggested some minor alterations that would be done within the week, since we didn’t need the suits that day. We ended up with the navy and the same suit in black as well as a new pair of dress shoes. We used a coupon from a “booster card” purchased through the school, which made it a little easier to buy two. What to do: Be curious. Have a set of questions ready to get to the issues of personality, preference, and beliefs but know how to ask them in a flowing conversation. Never assume you know the customer based on some outer cover (age, gender, race or what I look like at the moment). Make a game out of trying to provide the customer with the perfect “fit” for them; whatever they are looking for. 6. How do past experience, current mood, and present perceptions affect the experience? I’m sending my first born off to college so there is a wide range of emotions involved – for me. For him, he just wanted to get this over with – so impatience is probably the best word. We were on a specific mission and both sort of dreading the chance of not finding anything. We had a previous, similar experience of needing less formal dress clothes for an event occurring only a few days later. As with this experience, we got what we needed in very short order. The store doesn’t have the most beautiful or organized appearance, but since it provided exactly what we needed, the “ambiance” wasn’t a huge factor. In most instances, I would say it is. What to do: If you don’t have an electronic means of keeping personalized information about customers, work on skills that help you remember. Pay attention to body language, facial expressions, and tone as indicators of mood and adjust your communications accordingly. Provide the best-personalized service you can, each and every time. Be interested in me; not my number. I know prediction is possible because I’m quite certain my credit card company knows what I’m doing most days. They’ve caught a few purchases that weren’t out of my realm, but still contacted me to find out for sure and twice caught fraud as a result. However, I don’t think they could predict that I’d be purchasing not one, but two men’s suits and shoes that day. Nor do I think my two interactions with Mister Cool’s Clothing could provide accurate predictions of my customer lifetime value. No one wants to be a number. What works for me as a single customer doesn’t work for any other customer (because I am so unique and irreplaceable – ha-ha). Generalizations can help you plan for the business, but in the end, don’t discount the live person right in front of you.